The Well of Azusa East Has Opened! Ignite Dunn: Awakening The Well of Azusa East! 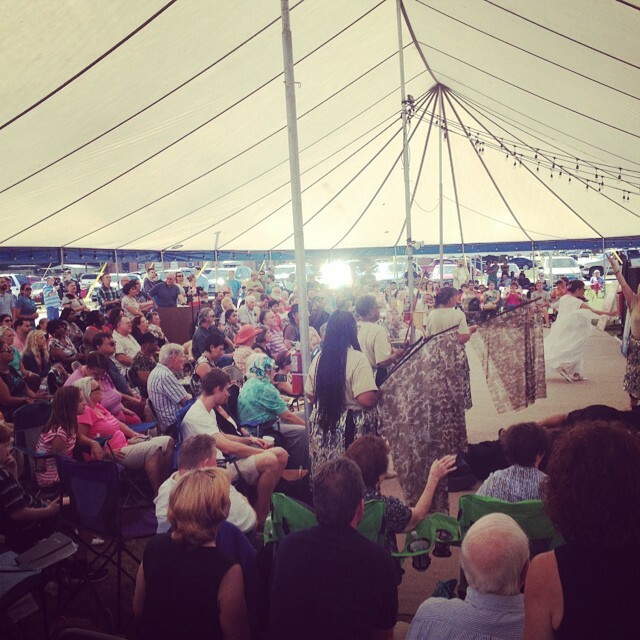 The Jesus Tent gathering at Azusa East (Dunn, NC) was unbelievable! 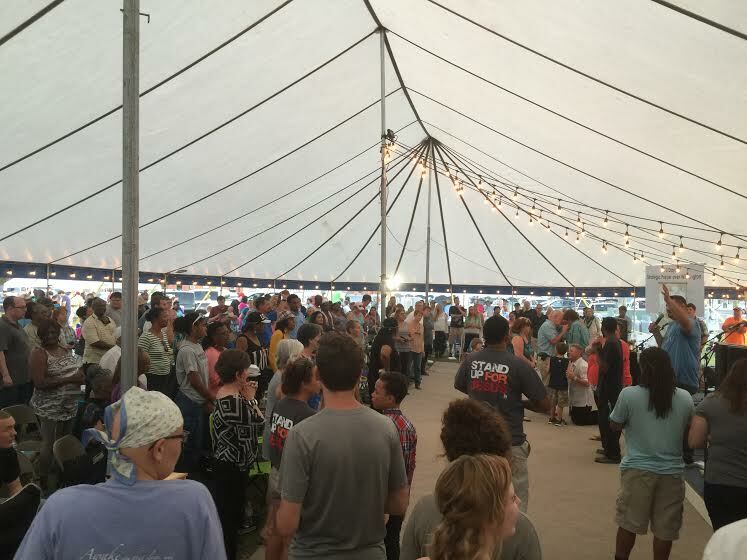 Hundreds gathered nightly as the release of God’s presence exploded throughout the tent and city. The well broke loose! 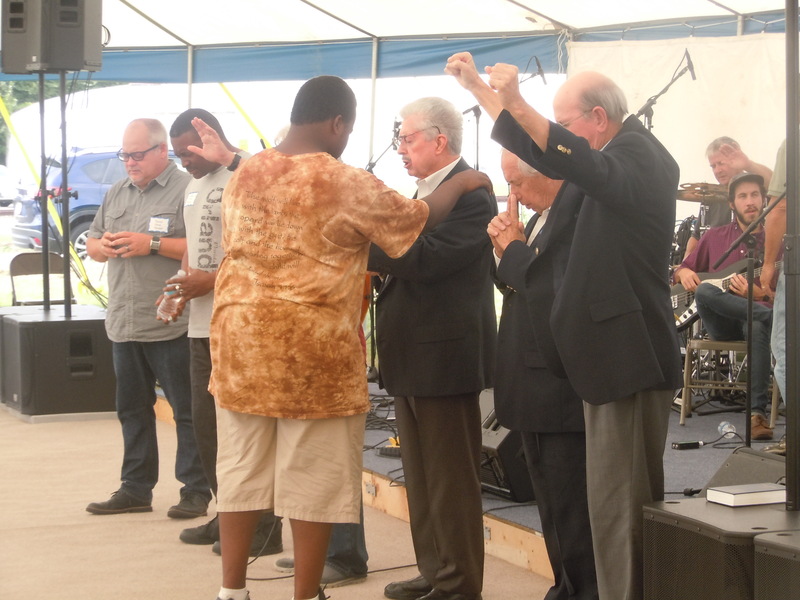 We saw many salvations, physical healings, and multiple demonic deliverances occur under the tent. Outside in the community, we saw rivers of Jesus flow through the streets of the city as outreach teams threw themselves into surrounding neighborhoods and businesses going door to door. From house to house & business to business, they demonstrated both the love and miracles of the gospel during the 5 days. 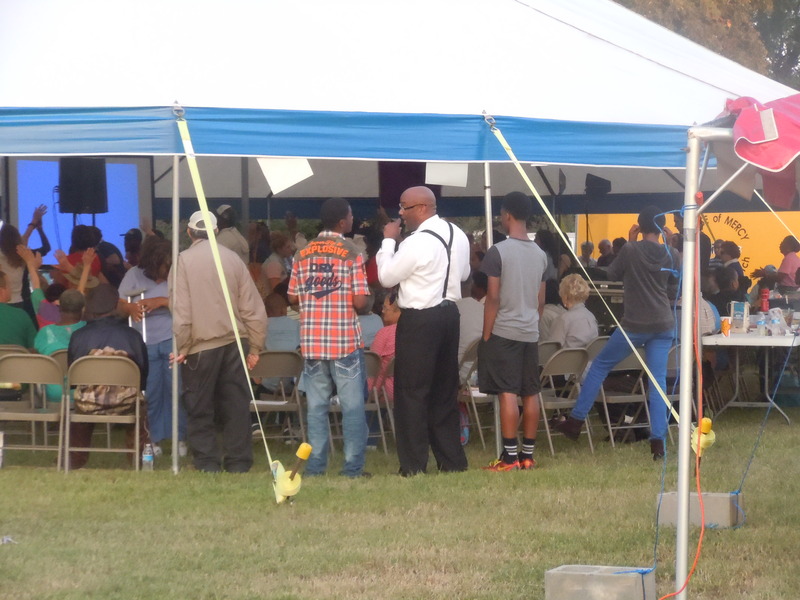 Entire households were saved and baptized back at the tent because of their labor! C-MON Jesus! The fields are ripe for harvest! It was amazing to see different streams of revival and denominations collide at Dunn. On the first night, we saw the many of the older Pentecostal leaders, who have been carrying the flame in that region for years, pass their fire to the younger upcoming generation! And how did they respond to receiving that mantle? They washed the feet of their elders! What a transaction at the well! C-MON! In addition, regional prayer & worship leaders came from Alabama, South Carolina, Virginia, and many other parts of the Carolinas. Through building day & night worship unto Jesus, they helped “roll away the stone” covering the mouth of the old well of Azusa East as sounds from heaven exploded through differing racial and church expressions. The well of Azusa East is speaking again! *We didn’t plan any of this, but brought volunteers and grills to cook. Jesus provided the rest! CRI organization donated hundreds of care packages to bless families with. 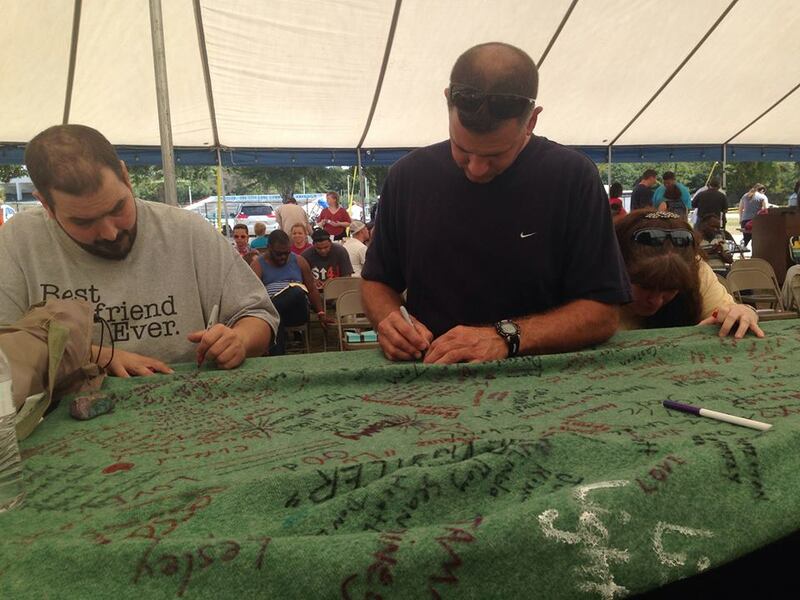 Some as many 40 people from the community would return to the tent nightly from outreaches. Meet D’shawn! The first night at the Jesus Tent, D’shawn gave his heart to Jesus and was water baptized. He said, “I am not leaving this tent.” He stayed with us the next 5 days both in the day and evening times. The last day, we did a city-wide treasure hunt from the tent. D’shawn couldn’t wait to learn how to hear God’s voice and then hit the streets with the team. When it was time to share, D’shawn mention how he saw a demonic spirit like a snake wrapped around his mother and that was somehow causing here not to see. His mom is legally blind. As the team set out to find treasure, they found themselves going to D’shawn’s mothers house. As they prayer for her she begin to throw up. A deliverance occurred right there in her living room. After it was finished she could see! Her eyes opened! As the team came back to the tent and shared that expereince D’shawn mother came walking up. She was touched and wanted to be baptized–so D’shawn who was baptized only 4 days prior lead his mom to the water and help baptize his momma! C-MON Jesus! Household Transformation! Whats Next? 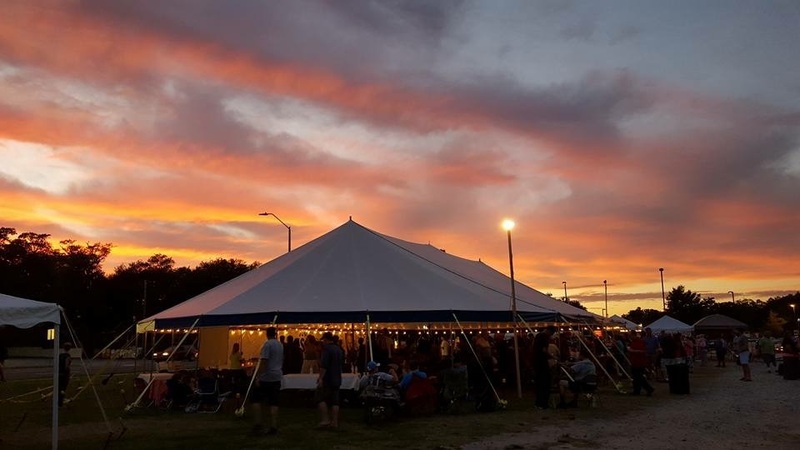 The Tent is going up Next Month in Wilmington! During April 5-13, over 120 people from the Carolinas joined together and flew out to Los Angeles, California, to see a move of God. And it has come! 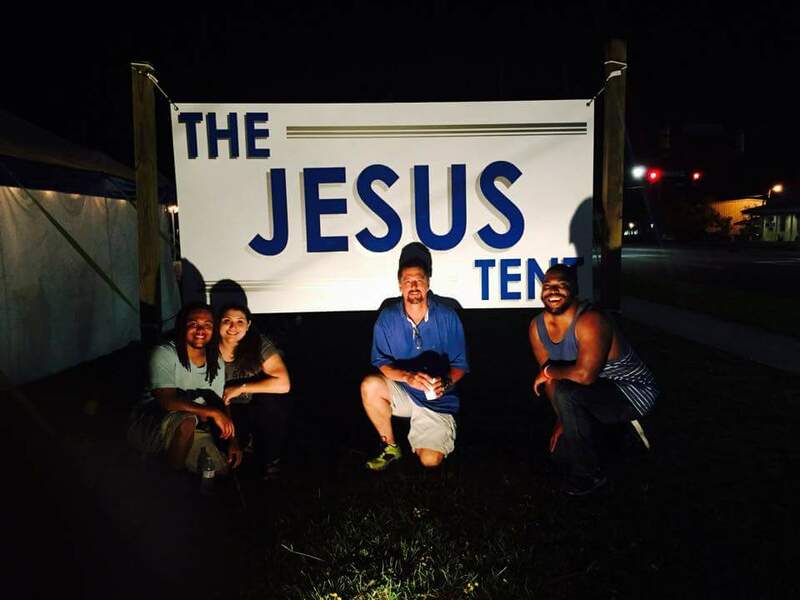 We erected our Jesus Tent on the original site of the Azusa Street Revival (1906). Right off San Pedro Street, the tent was situated at the foot of skid row, one of the most dangerous and largest homeless populations in America. To pull this off, the Lord brought us amazing help through the CRI (Crisis Responses International) team. Approximately, 50 of their volunteers flew in from all over America and stayed on cots at the Union Mission and helped us set-up the tent, feed the poor, and break open the historic well of Azusa Street. 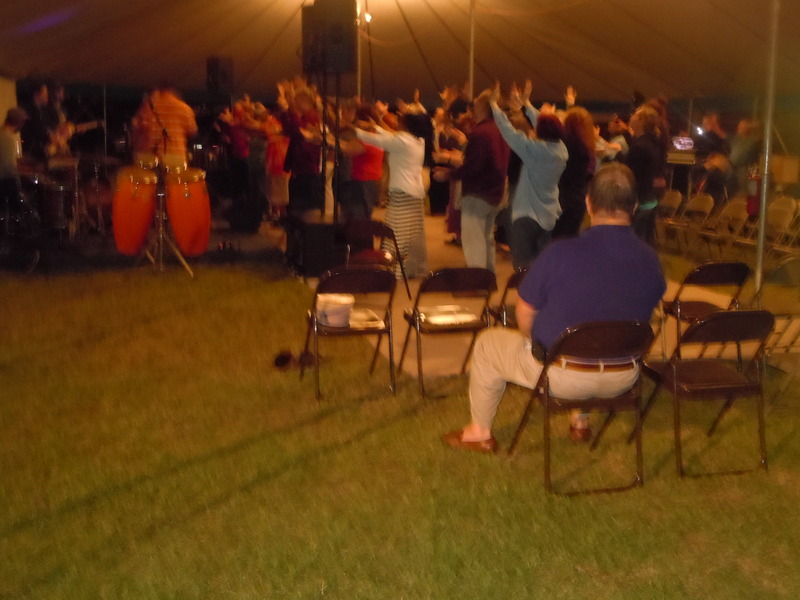 For several days worship teams and intercessors built day & night prayer and worship under the tent, and the power of God exploded! Our gathering at Azusa Street culminated on Sunday, April 10, when the city gave us permission to shut down San Pedro Street and cook food for the homeless all day. We came with an empty freezer not knowing anyone in L.A. but by April 10, churches and organizations had donated over 6,000 hotdogs and hamburgers. Setting tables in the streets, we fed over 5,000 people that day. In addition, teams from the Carolinas and east coast were outreaching in the heart of skid row and bringing them back for lunch. On April 9, we gathered in the Los Angles Memorial Coliseum with 100,000 other radical Jesus lovers to cry out to God for another wave of revival to hit America. Hundreds were saved and many came out of wheel chairs as waves of salvation and healing swept across the coliseum. It was an epic day of Revival and Awakening! Crowds stood out in the rain for 15 straight hours worshiping Jesus—what hunger still exists in the heart of this nation! I am so encouraged! Ignite Dunn: Awakening Azusa East!!! Coming out of Azusa, we feel the Lord is saying to gather in cities where the gates of revival have been established. Our first stop is Dunn, NC the site of Azusa East! 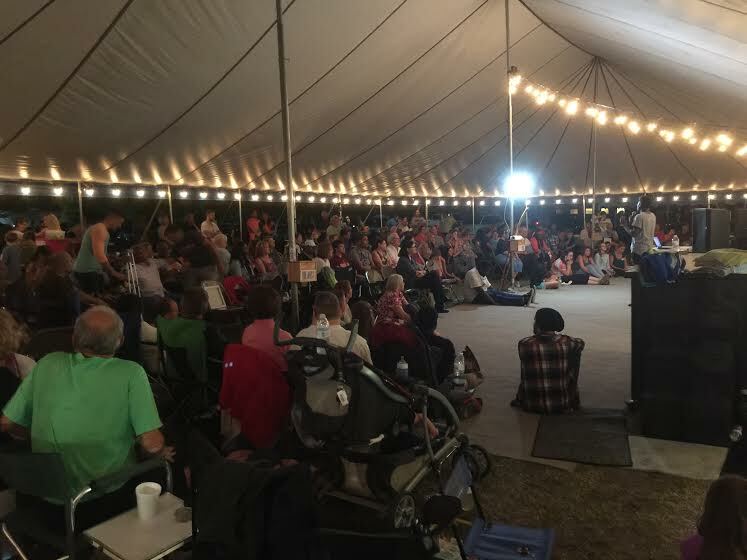 The Lord gave us word that if we gathered for 120 hrs under the Jesus Tent in Dunn, He would shake that gates of the city and break a 120-year spiritual drought over the Carolinas! From Azusa Street in the West to Azusa in the East, we believe Jesus is ripping open every hidden well in America. From this, we sense Jesus is launching us off on a spirit-lead tour with the Jesus Tent all round the Carolinas and even up into Boston later this fall. It’s going to be wild! Words cannot express what happened under the Jesus Tent on Carolina Beach road! From the very first cord that was struck on opening night, to the very last alter call given where hundreds danced off the chains of fear and depression, Ignite Wilmington was a powerful display of Jesus rescuing the lost, reviving the port city, and breaking down every dividing wall in Wilmington between races, generations, regions, and denominations. Perhaps the biggest and unexpected wall that came down during these 10 days was the wall between Church & State! With the Mayor, town council, and leading judges of New Hanover County calling us to the communion table, the first night was nothing less then historic! Caught up in a Psalm 24 moment, civil government leaders embraced the spiritual government leaders of the city in the place of communion in order to welcome King Jesus’ arrival into the Port City during opening night. C-MON! September 13, Fred Berry of Azusa Street Mission: Fred shared revival history and called 50 pastors of the city to form a fire tunnel the first night. As hundreds went through the prayer tunnel, people were rocked with the power of God! Some were completely delivered, some crying uncontrollable, and others walked right off the street drunk and came through sober, saved, and healed! September 17, Bob Hazlet of Touch of Fire Ministries & Power & Love School: Bob came and prophesied over every Pastor of Wilmington. He also called a fire tunnel on Thursday night where the Power of God exploded! One testimony from that night was recorded by Jonathan & Esther Futrell visiting from the Charlotte area. They write: “Thursday night we were waiting in line to go trough the prayer tunnel, and while we were waiting a young man who had road up on his bike showed up and was watching from about 10 feet away. Jonathan waved him over and invited him “Come on!” He was reluctant and obviously intoxicated, but after a few minutes he stood right next to Jonathan. Jonathan introduced himself over the noise as did he and I said his name was Garland. After we went through the prayer tunnel, we saw Garland crying and being prayed over by two pastors. Jonathan gave him a big hug and Garland said, “I don’t know what just happened.” Jonathan invited him back for Friday night, not knowing if he’d come back. Friday service started up, and there he came! A young man gave up his seat on the front row for Garland and he grinned ear to ear the whole service. He received more prayer Friday as well.” Garland, like many others, was actually saved in the fire tunnel during these nights! C-MON! #JustJesus! The Communion Table: Every night for ten nights we engaged in citywide communion. 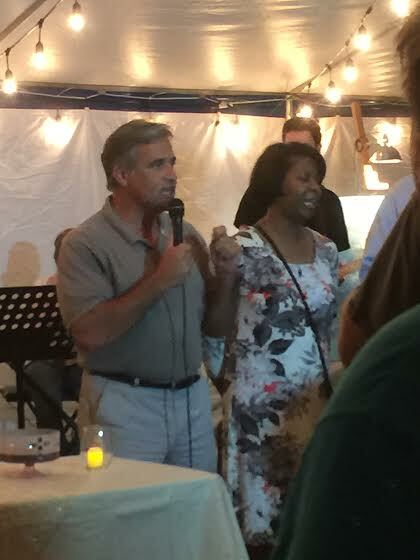 Mayor Saffo, Judge Fasion, and Judge Phyills Gorham helped oversee the prayer and communion the first night! Others nights the communion table was lead by Wilmington Pastors. Some of these included: Pastor Steve Mattis (Myrtle Grove Presbyterian), Pastor Robert Campbell (New Beginnings Church), Pastor Bruce Miller (The Lord’s Church), Pastor Tom Hauser (Global River Church), Tavetris Bracey (Harvesters Church), Sean P. Williams (Ignite 3 church), and several others. 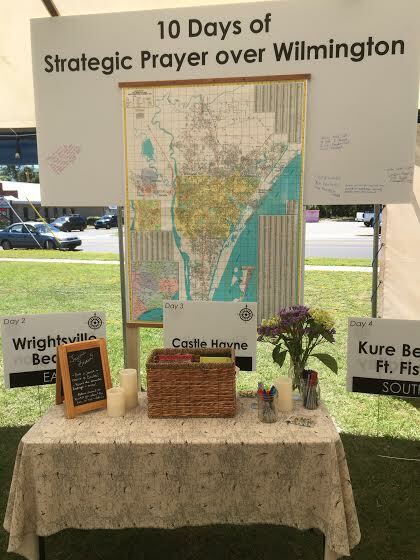 Wilmington War Room: Inspired by the movie War Room, we dedicated 10 days of strategic prayer & intersession over 10 different communities that make up the entire city of Wilmington. By hanging a 10 ft. detailed map of the city, we encouraged people to pray over every street, school, business, government, and public housing communities through out the city. Prayer warriors placed tacks & pins to mark specific streets and communities on the large map that they were moved to pray over. 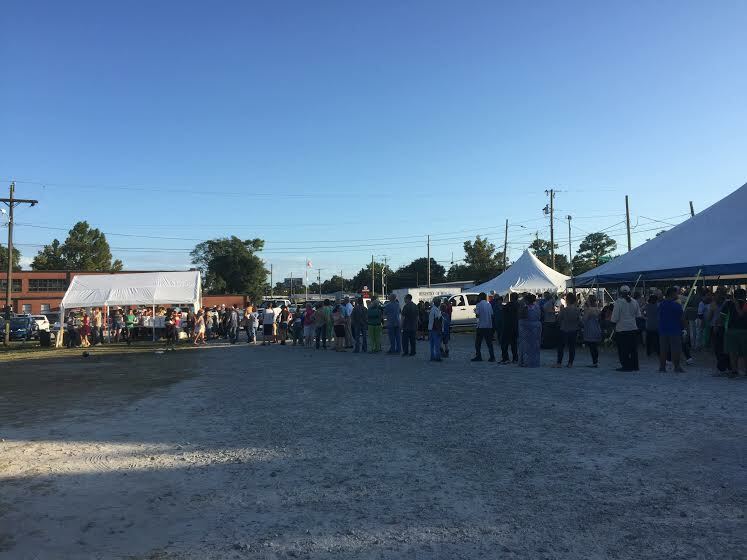 By the end of the 10 days, the entire city was blanketed with un-ending prayer and marked by the cries and tears offered by the church of Wilmington. We believe this will result in major transformation! 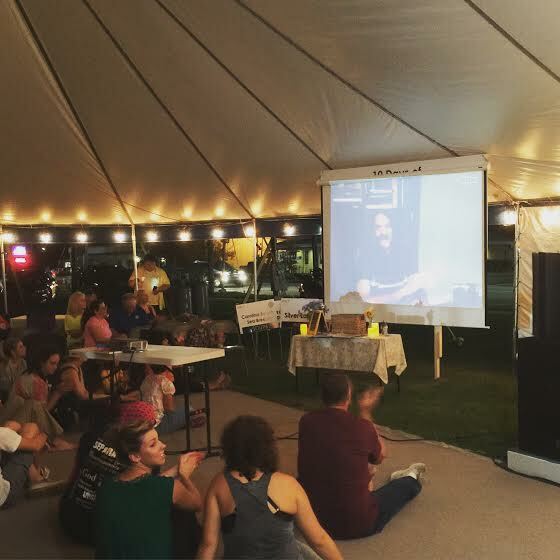 September 18, Live Skype with Lou Engle: On Friday night, Lou Engle skyped in with us at the tent live from Los Angeles. He was so stirred by ignite Wilmington and is convinced that God is stretching a tent from the Carolinas to California to usher in a national move of the Holy Spirit. He shared the vision of the Call Azusa Street next April! 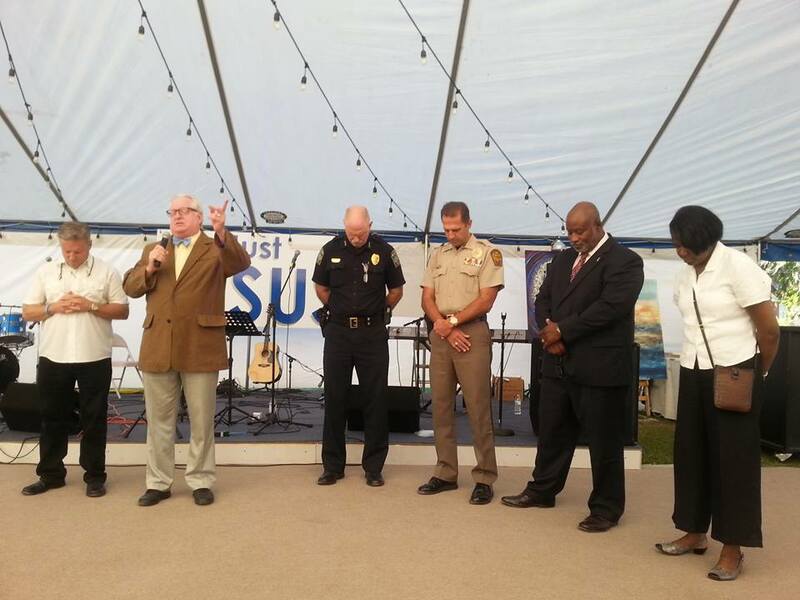 Amazingly, God has opened a door for us to pitch our Jesus Tent on 312 Azusa Street to help support the Call Azusa and Azusa Fest 2016. It will commence on the 110th anniversary of the Azusa Street Revival (April 1906). Surely, God is bringing Wilmington onto the national stage for the next mighty move of Revival in America! We believe by bringing the tent from Wilmington to Azusa Street, hidden wells of revival all throughout the South will be unlocked! September 19, The Boston Crew: Ryan Harris and a young team of musicians and revivalist’s drove all the way from Boston to Wilmington to play one set worship set and then turned around and drove back the next day! However, God brought the Fire upon their sacrifice in an unforgettable night where the presence of God exploded under the tent. 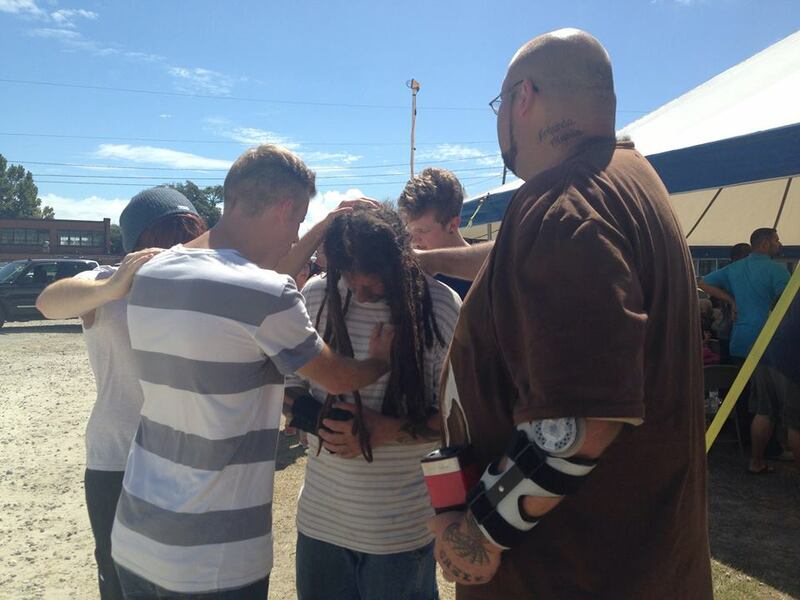 While they were worshipping about 6 or 7 random people came forward to receive salvation for the first time! Immediately some wanted to be baptized! So we broke open the portable tank and went into a spontaneous water baptism session. By the end, some 17 people came forward to be baptized! Jesus! Ryan then released some proclamations over Wilmington and declared our city gates were being opened by hand of God! With some 500 people present we were lead to have young people (30 & under) form 2 fire tunnel lines and prayer forevery person in the tent—WOW! People went down under the power of God! 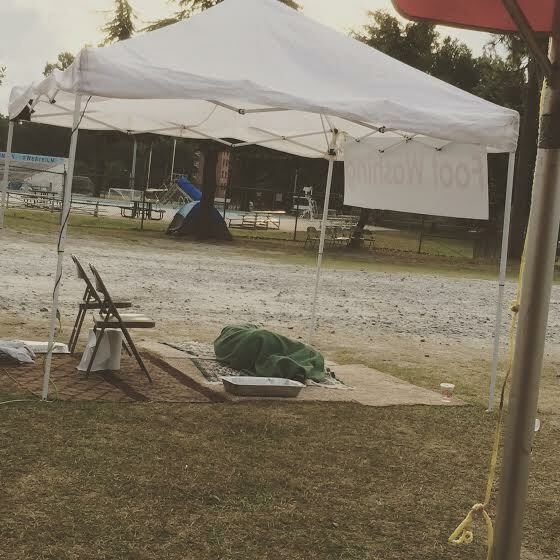 At one point, the entire front section of the tent was covered with bodies on the floor. Some shaking, some crying, some laughing! It was like a page right of revival history! Crutches, arm braces, hearing aids, eye patches, and other body supports were slung on the ground. Jesus healed them all!!! 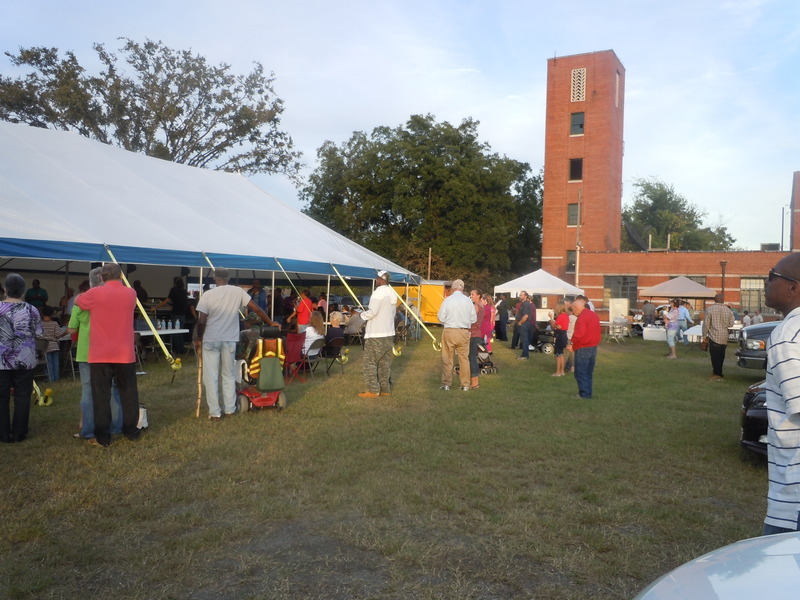 September 20, The Free Citywide Fish Fry: Hosted by White oak Community Church, we were able to give out 1,500 lbs of fresh fish and sides to over 3,000 people all for free! This is a powerful ministry through White oak church! Through their giving, we were able to spread a dinner table large enough to feed the entire city of Wilmington. Pastors and sinners, the homeless and wealthy, Baptist and Pentecostals, young and old, black and white; all gathered around the presence of Jesus and enjoyed a meal together with no distinction. 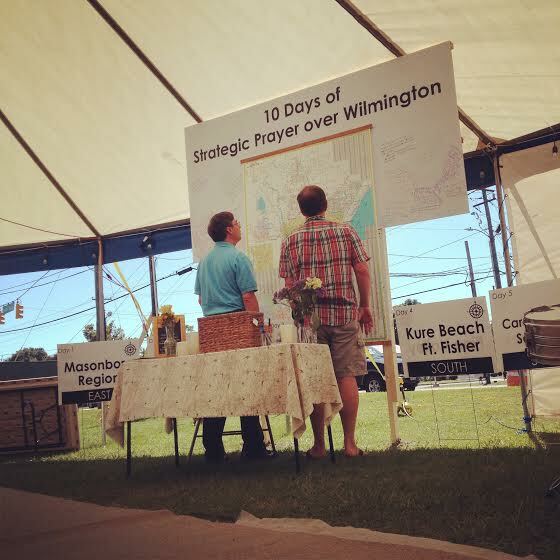 September 19, The 10 Hour Intensive Prayer Set: On this day, we gathered over 40 pastors and government leaders around North Carolina to pray into the 10 different aspects of Wilmington’s culture. Some areas included: the family, arts & entertainment, media, education, LGBT community, armed forces, and the government. It was during our prayer time for the government that Jesus showed up in a most profound way. Led by Congressman David Rouzer, several of this regions leading officials came to pray including: Mitch Cunningham, assistant Chief of Police, New Hanover County Sheriff Ed McMahan, County Commissioner Jonathan Barfield, and Judges Hockenberry and Gorham. As they first arrived, they were shocked to see about a dozen homeless people sleeping before the alter under the morning worship set. The spirit of humility immediately fell. The meekness of Jesus made so evident to these powerful dignitaries. 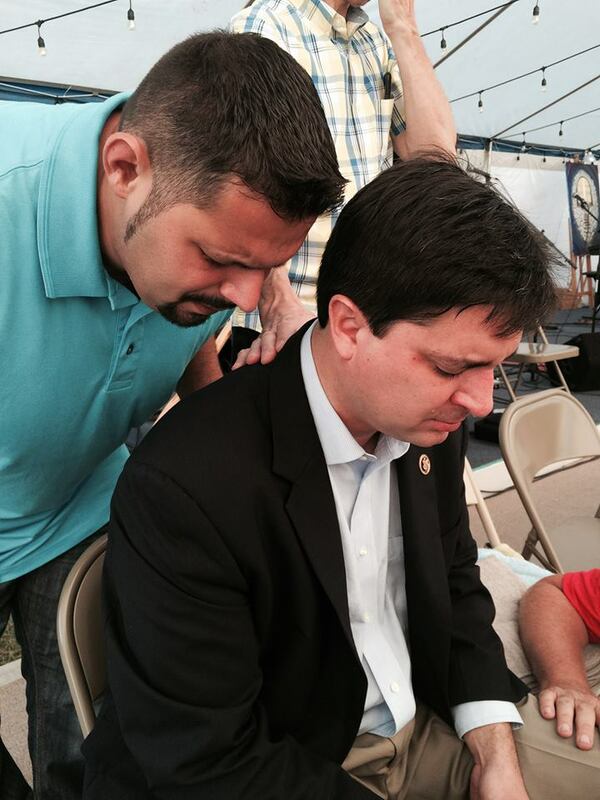 As congressman Rouzer opened in prayer, tears began to stream down his face. Compassion gripped him His words expressed a deep desire for his love towards Jesus and the least of these. 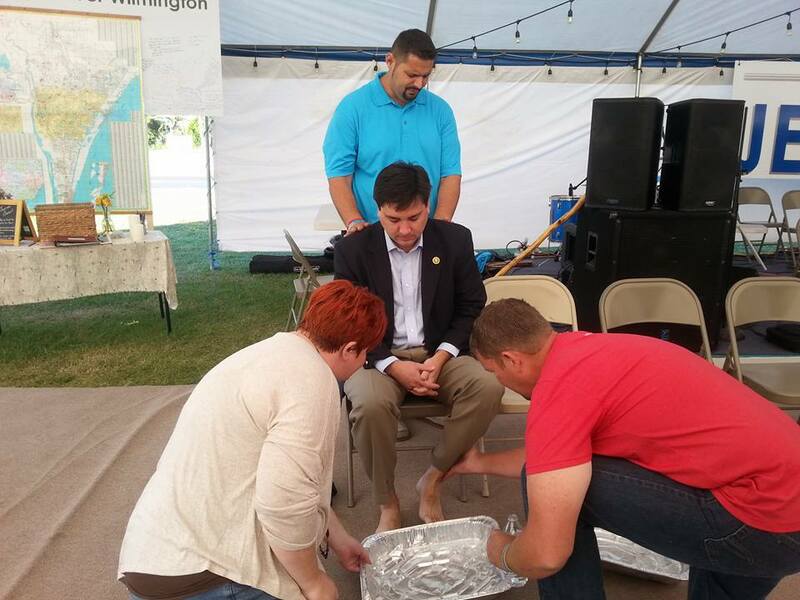 He closed his prayer by asking God, “Send the Holy Spirit across North Carolina.” Following his prayer, tent leaders were moved to respond by spontaneously washing the congressman’s feet as well as all the other city officials’. C-MON! 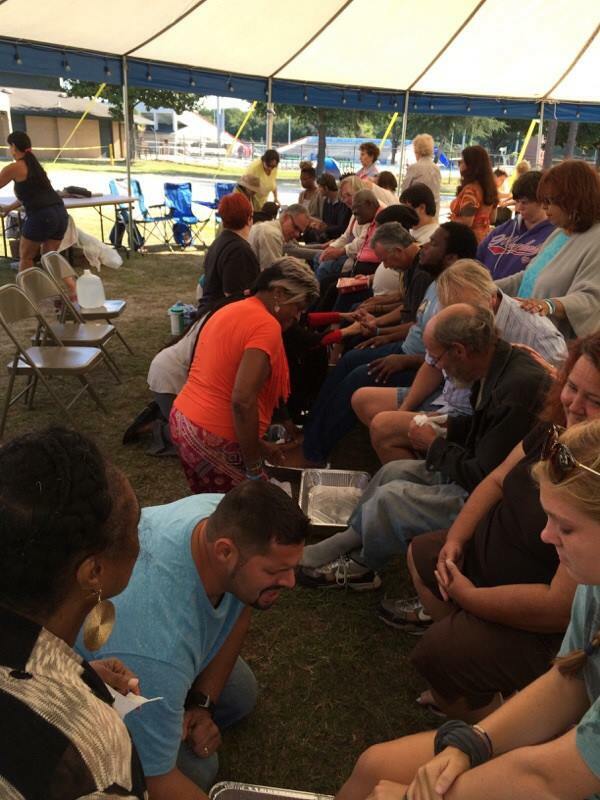 Church leaders washing the feet of the government leaders! What an experience this was! We believe through this act of Love, God is building a house of revival between the government and church leaders in North Carolina. Epic! I just wanted to post a blessing over this page and a sign of friendship and thankfulness of friendship I thank you for giving me the Jesus tent. I have been praying in my room to show me the way to replace the void in my heart that will be there after this tent is gone and he told me that I can have the Jesus tent where ever I want now. I have been listing to christian music and praying like I never have before. Lamenting and feverishly praying for him. 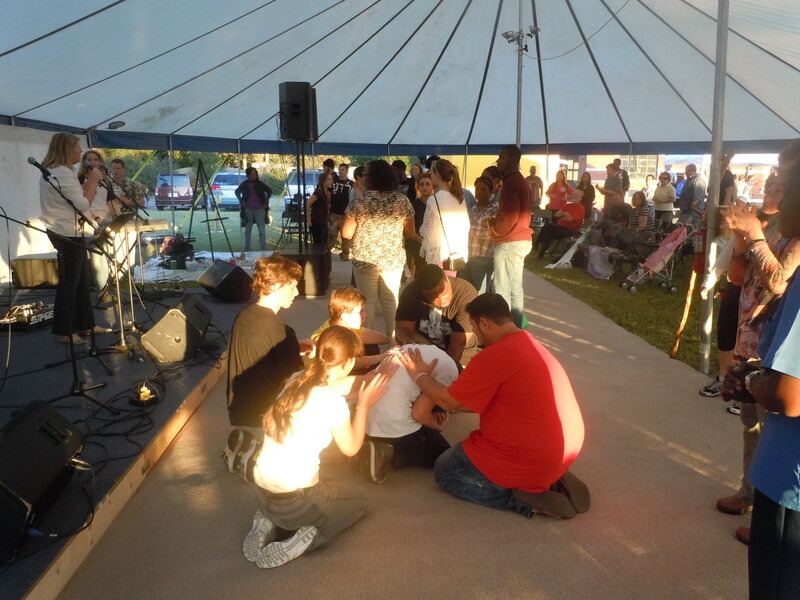 My life is forever changed I received healing and re newness of my soul in the tent. I received the gift of tongues and now speak them for guidance. Thanks for being my friend mike. I pray for a hedge of protection in your life and for you to know how much you affect peoples lives so that you may receive encouragement to the works of the lord. Amen. 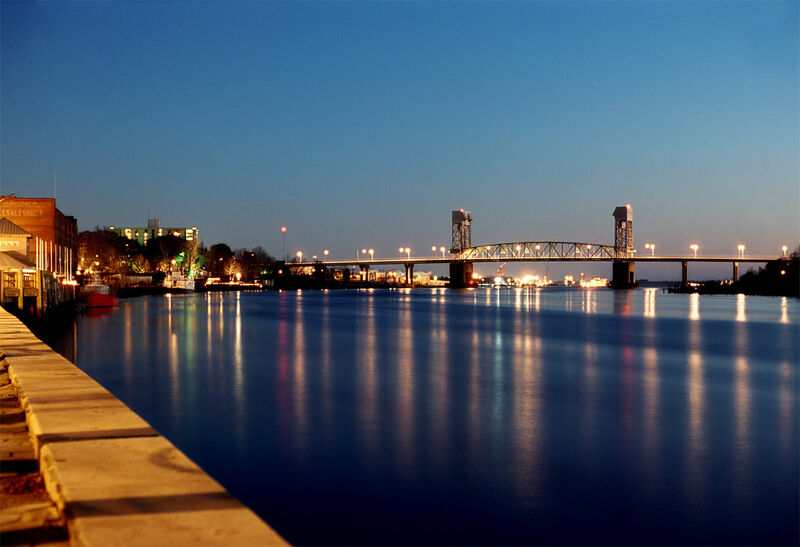 As I started my bike ride this evening, my intensions were to jump from the Memorial Bridge (Downtown Wilmington over Cape Fear River). I was directed away by police blocking 3rd street. As I wondered this direction, I came across the Just Jesus Revival. I stayed at the barricade looking in and longing to be a part of it. I was approached and invited inside. At that point, we prayed for healing over my deep feelings of depression. It is amazing to me, Jesus could still love me after all the things I have done to my family and friends. If only I could forgive myself. Lost for words. I will ride past that bridge. Please pray for me and my family and those lost deep down the road of depression. My dad Gary Reeves has been healed by the power of Jesus Christ of being able to walk again. Today I was finally able to forgive three people who have hurt me badly. I prayed about them, I prayed for them as well as thanked Jesus for the gift and peace of forgiveness. Bless this city! I love you Jesus!!! Last night June Bell prayed for me w/o knowledge of anything of me. 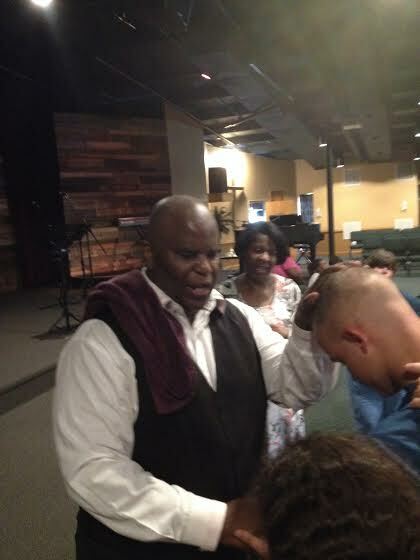 The Holy Ghost took over and put me “out” and God reached down from heaven and removed the growing lump in my throat. Wow. Jesus is awesome. The tent has changed my life. I have always known Jesus but now I know Him even better thanks to the past week or so. I have been filled with so much peace, joy, love, glory, and hope nothing can stand in the way of that. I went through the worst season of heartbreak but now, I can declare that in the name of Jesus, my heart is healed. So blessed and honored to meet such lovely people from every walk of life and every culture come together as one Body of Christ. It is like a slice of heaven. I have been to the tent now on three occasions and each time I am drawn by the spirit to return and what is even more heart warming is each visit I feel the presence so strong of the Holy Spirit till I find it difficult to leave. I am so grateful for this encounter and I pray God, continues to bless this tent and its soldiers wherever they go to witness next. Meet Rob! Rob is the guy with long dreads. 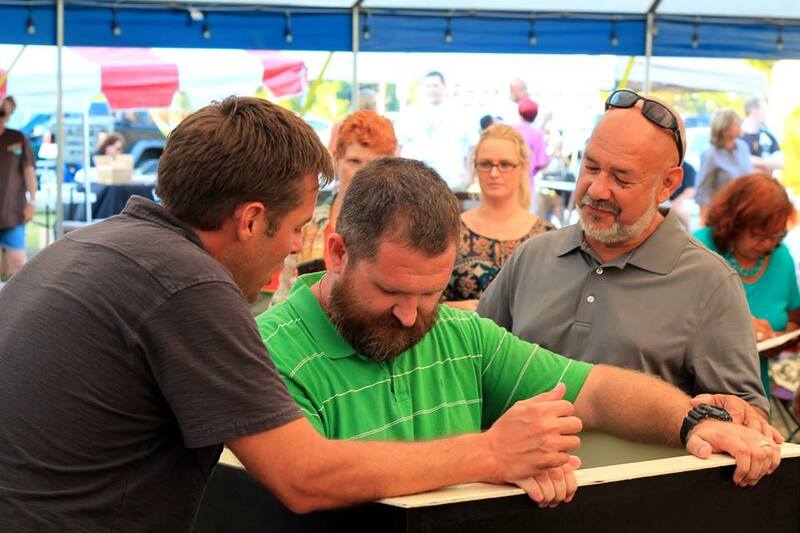 The day we received the potable water baptismal tank and filled it with water, Rob just happened to walk in off the street, encountered Jesus under the tent, received salvation, and then was baptized all with 30 minutes of the tank being filled. The next day Rob brought a donation of dinner rolls and breads for the nights meal. C-MON!!! This one of the many homeless converts that came to sleep under the presence of day & night worship. Prior to the start of ignite wilmington, the city gave us a very hard time with the use of their bathrooms on the property. There major reason was that they didn’t want the homeless sleeping in the bathrooms, a liability issue. After we assured them we wouldn’t allow it, they gave us key to bathrooms. We had a small team who cleaned them daily. One evening however, someone forgot to lock the supply closet in the bathrooms. I was told the homeless got into the bathrooms, but not to sleep in them, rather they cleaned them from top to bottom. Wow! Left me speechless! I was reminded of Jesus’s words, “Foxes have holes, and birds of the air have nests, but the Son of Man has no place to lay his head.” In short, Jesus identified with the homeless so much because he himself was homeless! 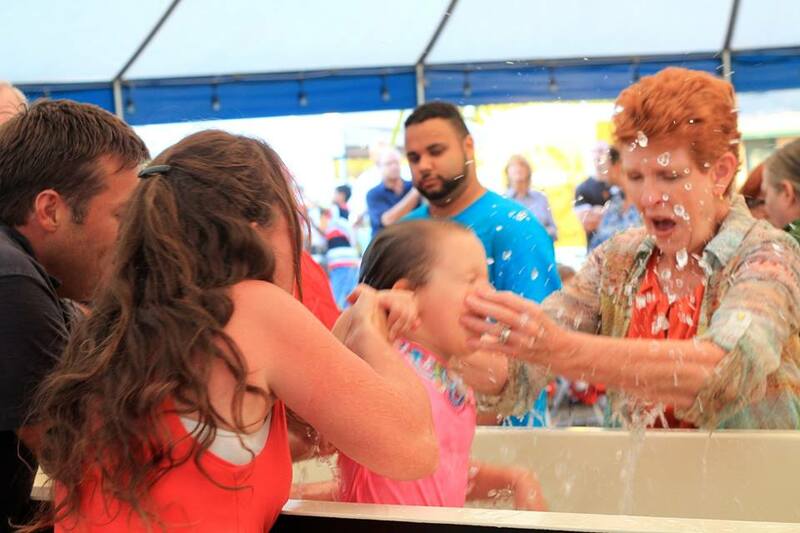 These are just some of the 19 baptisms that took place under the tent. Spontaneous foot washing & prayer over the city. 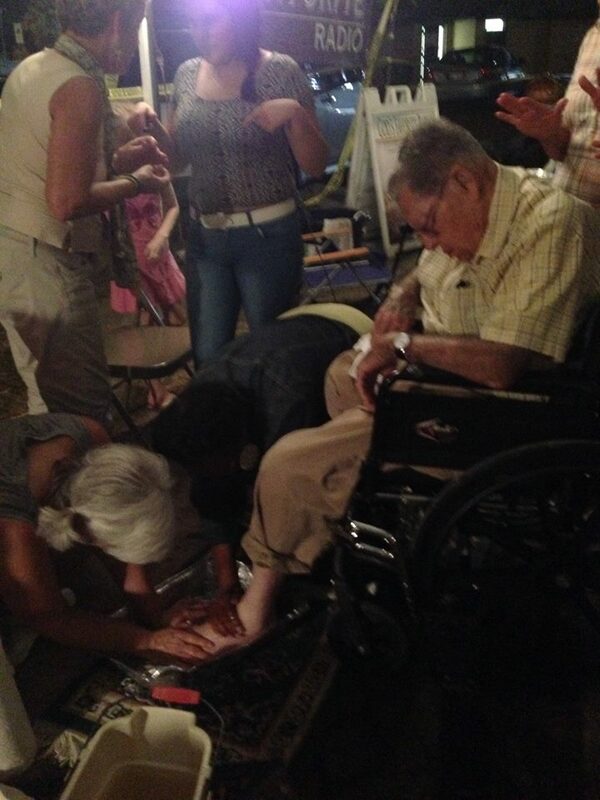 One woman walked up with a bad fracture in her foot and was instantly healed while her feet were washed! 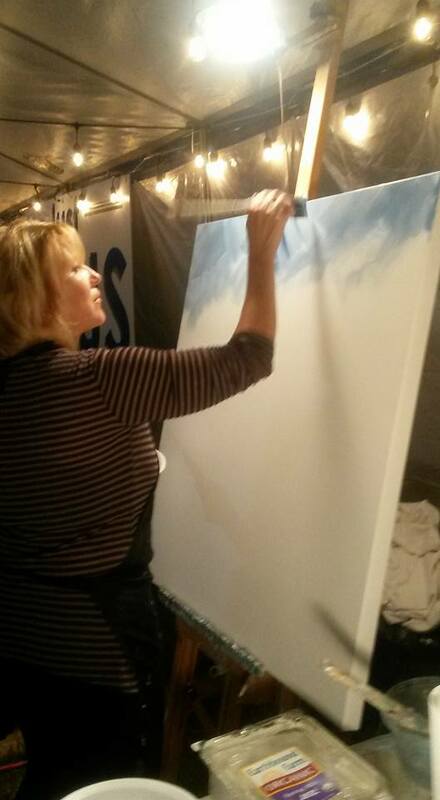 Prophetic art was expressed by numerous artists from all over North Carolina during the 10 days! 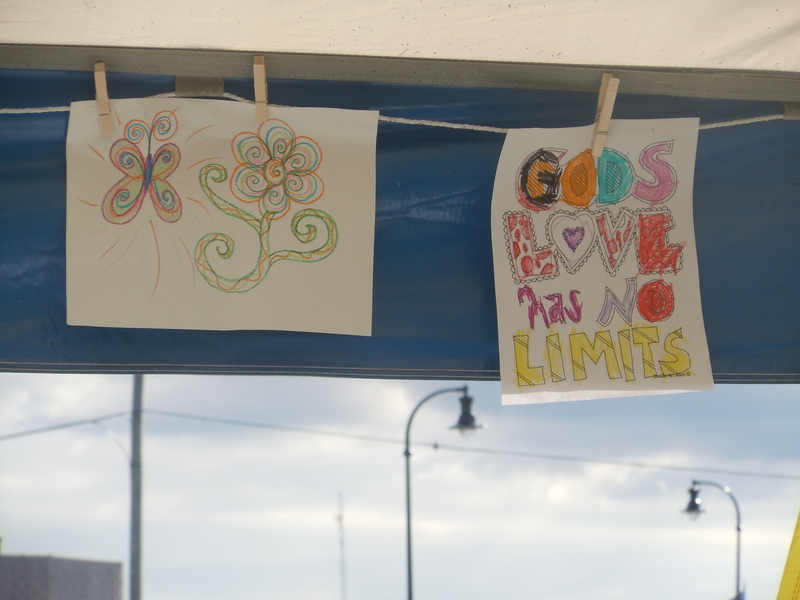 Some of our painters even included the children by empowering them to express their hearts and visions of Jesus through painting! So good! 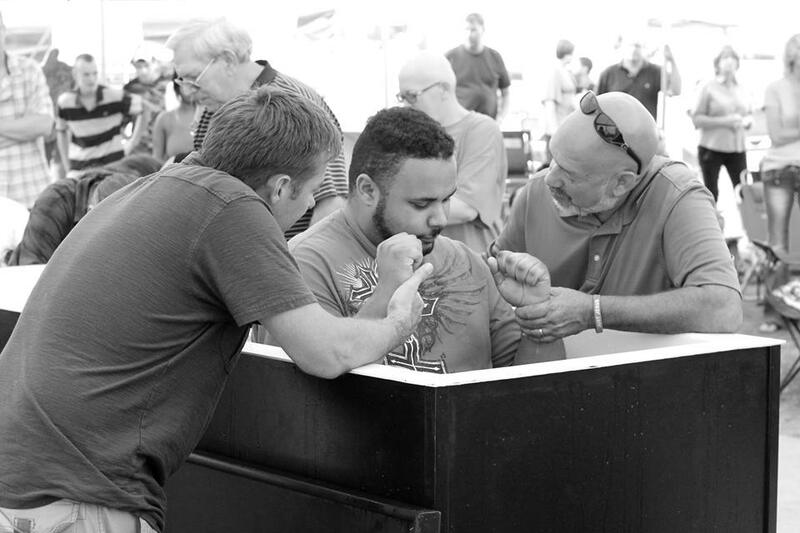 In all, we believed nearly 25 + people received salvation for the first time. 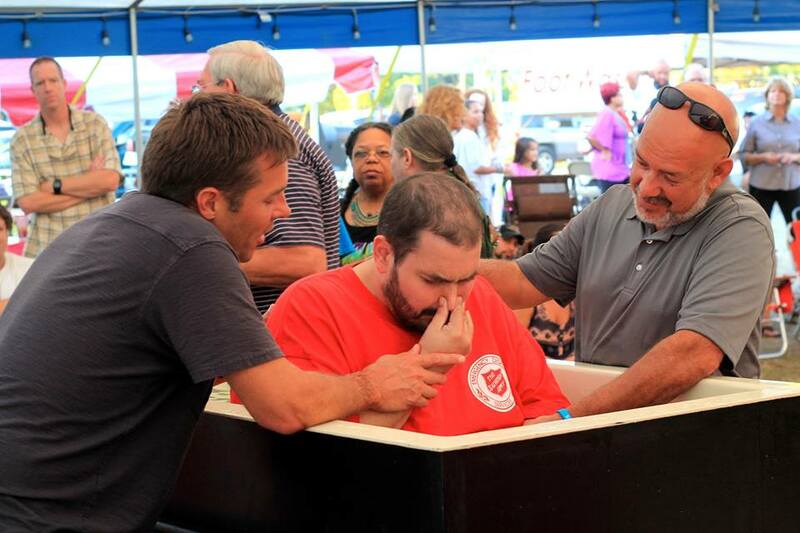 Approximately 20 or so were also baptized during the 10 days. There were numerous rededication’s back to the Lord, and at least a hundred cases of physical healing that took place in people’s bodies. We also had about a dozen of demonic deliverance’s occur as well. To Jesus be all the Glory! We believe God’s heart is pleased and the assignment to shift the destiny of the city has begun! Excited to see what God has in store next for the Port City! We are so excited to announce that the tent will be going up next April 5-13 on 312 Azusa Street to help support the Call Azusa! God had given us an assignment to help Los Angles break open the old well of Azusa Street! We are being led to do this by merging worship leaders & intercessors from the Carolinas with those in California. Over 120,000 are expected to gather from all around the world for this epic gathering. Many are being drawn by Williams Seymour’s dream that in our generation (100+ years after Azusa Street) God will send another great wave of revival to America! We are linking up with Lou Engle and Pastor Fred Berry to place the tent on the exact site where the Azusa Mission once stood. Our tent will be joining in with 30 other tents that will be set-up through Los Angels! This is going to be the trip of a life time! April 9, 2015 mthornton80Check out this new Blog Post about ignite Wilmington! Gonna be wild! Two years ago, on November 2, 2013, over 1,000 believers came together in downtown Wilmington to prayer march 1.8 miles of the city. Compelled by a heavenly synergy of different denominations, generations, and racial backgrounds all coming together, it was a breath-taking display of the church taking back their city. Just before the prayer march was completed, the crowd gathered directly on the site of where a massive holiness revival shook the port city in 1892. Standing directly on these revival bones of history, prayer leaders and government officials from all around state began to appeal to the courts of heaven for God to break-open the revival wells running deep beneath Wilmington. As prayers began to fill the atmosphere, the dry bones of Wilmington began to rattle! Like Zachariah in the temple, God had heard our prayer. I want to move here in Wilmington. 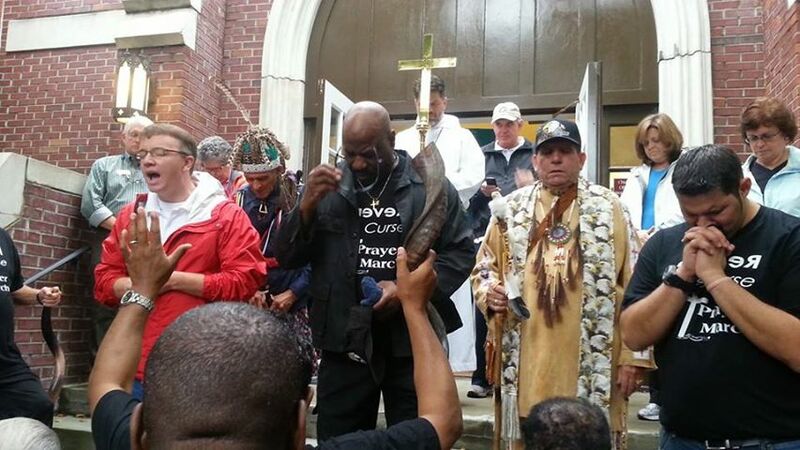 During the Reverse the Curse prayer March in 2013 the gate of the enemy was closed. Now, in 2015, I want you to RE-OPEN the port so that I can walk in! For 10 days & nights I want you to gather leaders and people to worship me! To seek my face! Over those 10 days, I will break the cycles of sin and spiritual slavery over Wilmington. This is the year I will come through the open port. As you gather the fathers of the city I will gather the sons. Through this gathering I will redeem Wilmington in 3 ways: I will redeem her people, land, and destiny. While praying for confirmation of this one afternoon, my phone rang. It was a young lady who has never called me before and I only met once in my life. Her father-in-law is a local pastor. 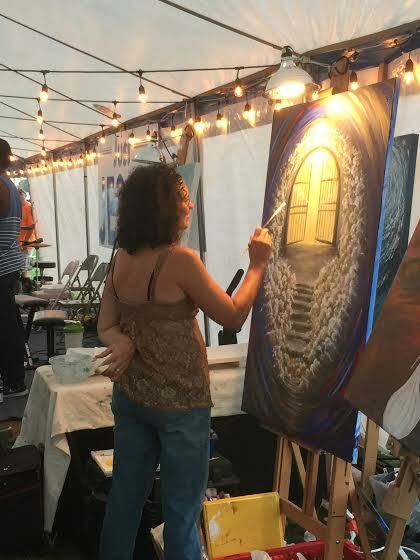 She told me, “Don’t think I am crazy, but God told me to call you and give you a message.” She went on to say that while she was praying several days prior, God gave her a vision of the footprint of Jesus over the entire city of Wilmington. He spoke to her and said, “He was going to move in Wilmington in 2015. That this was the year of the cities Restoration.” He also told her that there are idols in the city that must come down, and that He (Jesus) needed to be placed in authority to do so. After this, God burned my face into her mind and said, “tell this to Michael Thornton he will know what to do.” Amazingly, WHILE I am praying for confirmation to set up tent here, this call comes! 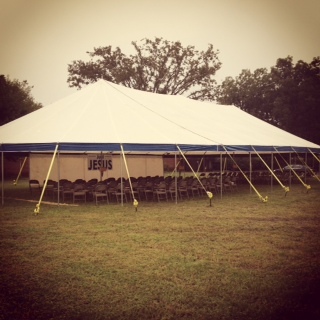 Knowing God was breathing on this, I began to ask Jesus where He wanted to set the tent up. The next day, a young doctor contacted me through our website. He said he had a vision of Wilmington while driving to work. We had never met before, but I just knew Jesus was stirring this. 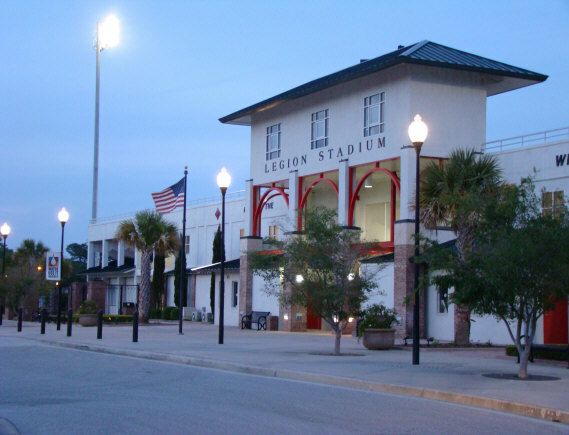 After our meeting, he shared with me a vision he saw around Legion Stadium in Wilmington. He said he saw worship team after worship team come and lift up Jesus. People with campers were pulling in and camping out. And through explosive worship, miracles, salvations, and healings were breaking loose. Jesus so filled the atmosphere, people were getting touched everywhere! Immediately, I tracked down the director of Legion Stadium to see if we could use it to set up the tent. Because the field had just received new grass, he wouldn’t let us it. “However,” he said, ‘the Armory building is right next-door.” So we went next-door. The Sgt. unusually welcomed us and consented to letting use their property (which is right in front of the stadium) to set the tent up. All we had to do is sign a contract with his Gunnery Sgt. in Fayetteville ( 2 hrs away). After 2 months of trying to make contact with Gunny Sgt. in Fayetteville, I received no response. I was getting a little discouraged. Then one morning while passing the Amory building, Jesus urged me to pull over and go inside. Sure enough the first person I see is the Gunny Sgt. From Fayetteville, NC who just happened to be visiting the Wilmington Armory that morning. Both he and I were overwhelmed and could feel the presence of Jesus. He turned to the younger Sgt. and said “give them whatever they need.” So that day I walked out of there with a signed contract in which they did not charge us a dime to use for the 10 days!! C-MON!!! So excited about what Jesus is doing in Wilmington! 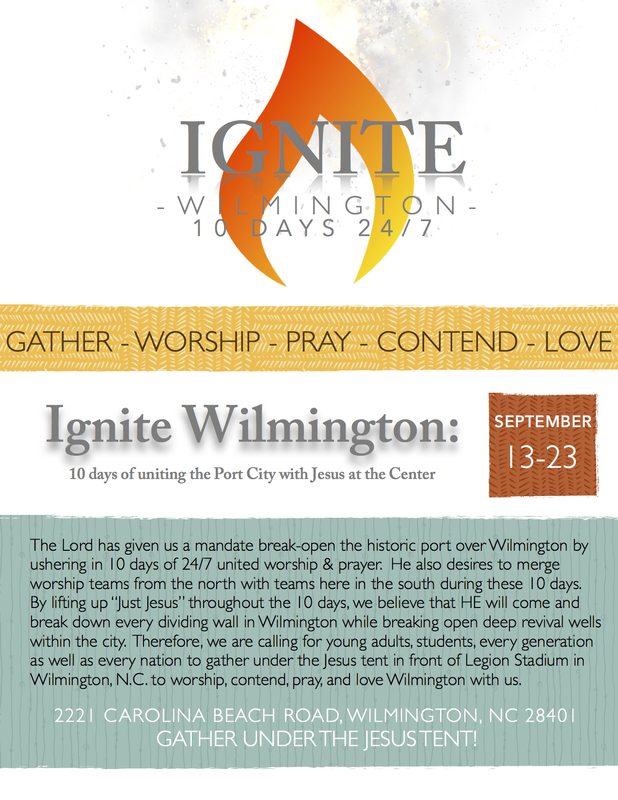 The Lord has given us a mandate break-open the historic port over Wilmington by ushering in 10 days of 24/7 united worship & prayer. That is 240 consecutive hours where the flame of worship & prayer for the city and region will not go out. We are calling for 50+ worship teams both local and regional to come and help us lift jesus name higher then its ever been in the Port City. Young adult worship teams from the Carolinas to Pennsylvania are already coming! By lifting up “Just Jesus” throughout the 10 days, we believe that HE will come and break down every dividing wall in Wilmington while breaking open deep revival wells within the city. Therefore, we are calling for young adults, students, every generation as well as every nation to gather under the Jesus tent in front of Legion Stadium in Wilmington, N.C. to worship, contend, pray, and love Jesus and this city with us! A few weeks ago, we were privileged to be apart of yet another historic gathering that took place in the heart of Eastern North Carolina, Greenville. Hosted by our good friends the Lilley’s, the Phenomenon two day meeting was exceptional! Hundreds of young adults all over the Carolinas and Virginia came together in what seemed to be an explosion of God’s presence! In addition to people keeping the Fire on the Alter burning throughout the night, outreach teams seized the streets of downtown Greenville and moved with great boldness and love. 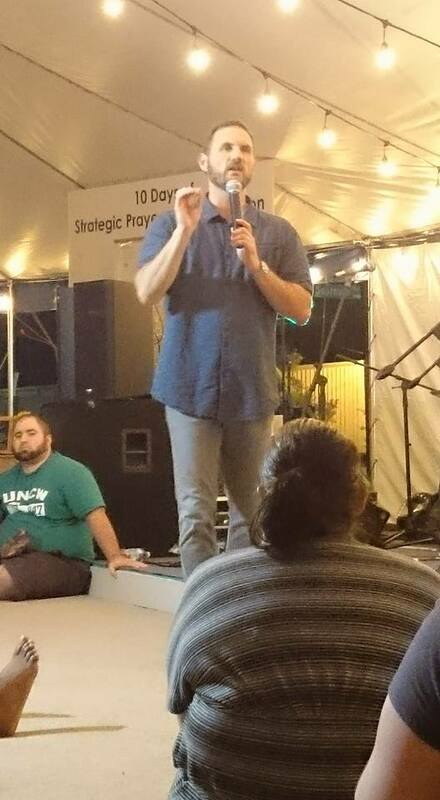 One testimony even included a self-professing gay women who turned her heart to Jesus right there on the street! C-MON! How exciting! Therefore, I would like to dedicate this blog post to the Phenomenon Conference and all what God did there. The following article was published by Matthew Lilley, director of the Burn Greenville, and visionary of the Phenomenon gathering. Please enjoy! Phenomenon was an amazing weekend of worship, prayer, unity and awakening. As one attendee said…. Friday night launched with a shout that began over an hour of worship. Frank Boone and I led worship. In the midst of worship, the ministry team came up to the front (this usually happens after the sermon), and people were invited forward for prayer. My view from the stage made it clear that God was touching and changing lives. I saw tears flowing, people falling to their knees. God was doing as much during worship as He did through the other times. I heard one testimony of a lady who encountered God during worship and said she went back to her church and is not the same anymore. We believe in the power of the presence of God! We did a limited-edition CD pre-release of Let Incense Rise: Live Worship from the Boiler Room, a new worship album that contains many of the songs we sang Friday night at Phenomenon. The album will be available on iTunes and other outlets on Tuesday, November 18! After worship, the Enteraction dance team performed a powerful dance that stirred our hearts for awakening and prayer! I love that team of young radical Jesus-lovers. They are a testimony of what God is doing (and wants to do) in a generation of teenagers and young adults. I believe that the coming revival will be energized by an loving army of young people! Sean Feucht, the founder of Burn 24-7 blasted us with a message that challenged us to worship and pray from a place that is rooted in the unchanging goodness and faithfulness of God, rather than letting our prayer wax and wane with the fear and uncertainty of the circumstances around us. Sean travels the nations relentlessly, and his testimonies of the advancement of God’s kingdom in the earth gave us fresh faith. Sean’s hope and joy are always an encouragement! After Friday night’s session, about 100 of the conference attendees headed to downtown Greenville for Fire on the Altar, with all-night worship, prayer and outreach. Worship teams from across North and South Carolina kept the fire burning at the Boiler Room while dozens went to spread God’s love in the downtown streets! Along with an amazing expression of multi-state unity and the presence of God, a few powerful testimonies came out. A lesbian came to know Jesus for the first time! A street musician came into the Boiler Room and ended up laying on the front altar repenting and soaking in God’s presence for over three hours! What an amazing expression of “fire and fragrance”! The day & night prayer & worship phenomenon around the earth is coming together with a radical expression of outreach to see transformation! Saturday morning conference sessions are usually considered the less exciting (and less attended) sessions, but Saturday morning at Phenomenon was one of the most powerful times all weekend. BJ & Lisa Sullivan led us in a sweet time of worship, as God brought healing, hope and restoration to hearts. Mike Thornton shared a message based on a prophetic word he received – God wanted to align the wells of heaven and earth, the worship of heaven and earth and the words of heaven and earth. After his message, there was a powerful ministry time as the altars were flooded with people on their knees… crying, shaking (and after a while… also laughing with joy! see Acts 3:19). God was marking messengers, musicians and singers. Deep repentance and healing was taking place. Some were being marked to give themselves to certain cities or nations to contend for revival in those geographies! One of the things God led us to emphasize at Phenomenon was the campus awakening phenomenon happening on campuses in the Carolinas and around the world. Students from North Carolina campuses shared testimonies at the Saturday morning and Saturday night sessions of how God is stirring prayer, unity and revival! Students are hosting all-night worship and prayer sessions, campuses are coming together for multi-campus worship nights, radical outreaches are taking place – God is moving! Niko Peele of Ignite Carolina is one of our good friends who is on the front-lines of campus awakening in the Carolinas and beyond. He hosted a Saturday afternoon breakout session specifically for students. Two other breakout sessions included Mike Thornton’s session on Digging the Wells of Revival, and a breakout for musicians and singers led by Sean Feucht, Ian Thornton and David Bradshaw. The Saturday night session exploded with a worship session led by Incense & Arrows. As they sang “O Mighty Ones”, the room erupted with dancing, shouting and wild worship! David Bradshaw, director of the Fredericksburg Prayer Furnace, brought an amazing message, nearly preaching the entire book of Acts! He spoke of the Upper Room “sacred assembly” being a prototype of how the Church should be constantly functioned, in a place of unified, prayerful waiting on the Lord. The evening ended soberly with a time of “tarrying”, and as we waited, God poured out the fire of His Spirit upon us and spontaneous songs filled the room! God spoke to me about this gathering nearly a year in advance. It had been four years since we hosted a Worshipfest gathering, and I sensed God saying it was time to do another large conference. He gave me the word “Phenomenon”, and the four main “phenomenons” (prayer movement, campus awakening, revival and Jesus) well in advance, and I knew the whole weekend was ordained by God. Phenomenon certainly exceeded my expectations, and I am so excited about how the Jesus movement is advancing in our region and on the east coast! Words cannot express what happened. Just Jesus! 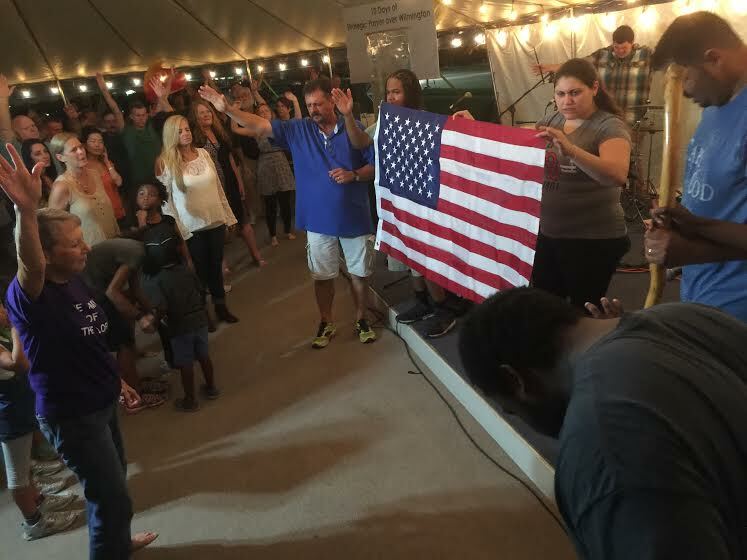 From the very first cord that was struck on opening night, to the very last alter call given where hundreds received supernatural healings and radical salvation experiences, ignite Goldsboro was a powerful display of Jesus rescuing the lost, reviving the saved, and breaking down every dividing wall in Goldsboro. Nearly 40 worship teams came and imparted during the 7 day 24/7 worship gathering. 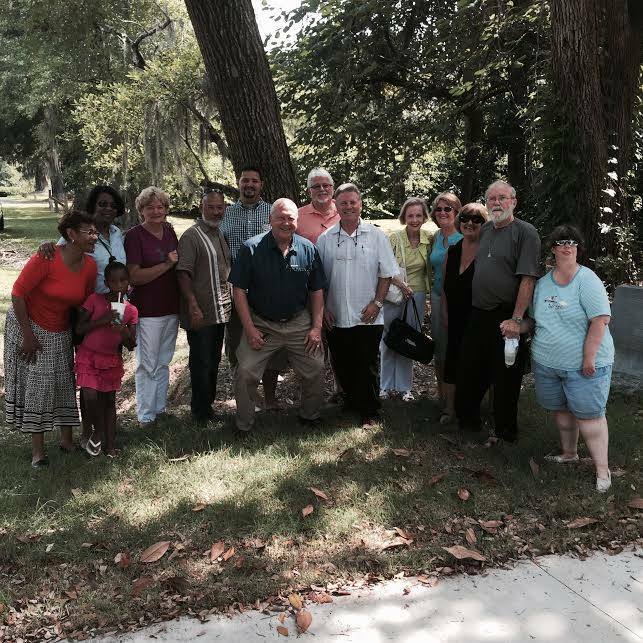 Some were local and some traveled as far as Spartanburg, S.C. to come and bless this historic revival city. 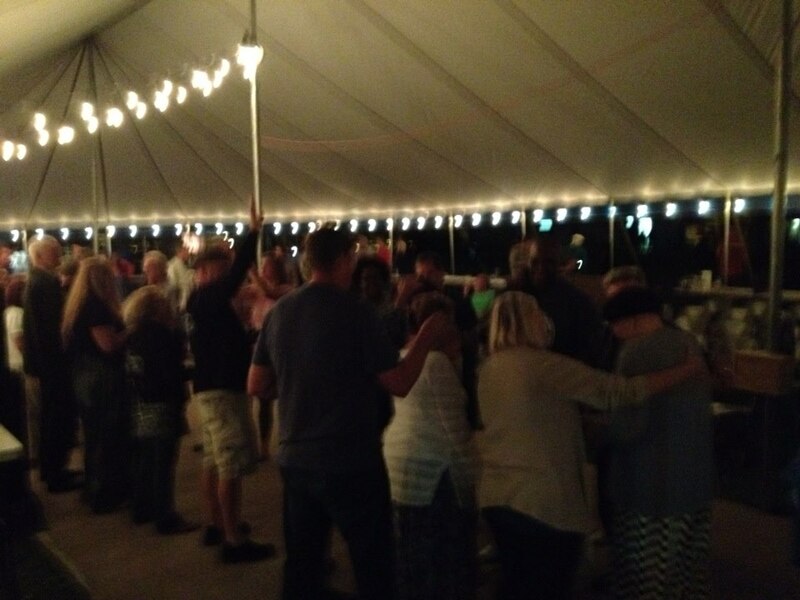 As unending worship was given to Jesus, those present could feel the old revival well of Goldsboro burst open with such force that even drug addicts and prostitutes were being drawn off street corners giving themselves to Jesus and finding salvation, healing, and just plain ole’ fashion LOVE! Although there were some messages sprinkled throughout, it was the purity of unbroken worship & prayer for 147 straight hours unto the Lord that turned the heart of a city back to Jesus. The homeless filled the tent both day and night. Glued to their seats, many were unable to leave the tent and didn’t want to. Just by sitting under the waves of His presence, within just a few hours you could physically see facial expressions change, eyes that were cold and dark began to burn with light, and many seem to glow with a light not of this world. 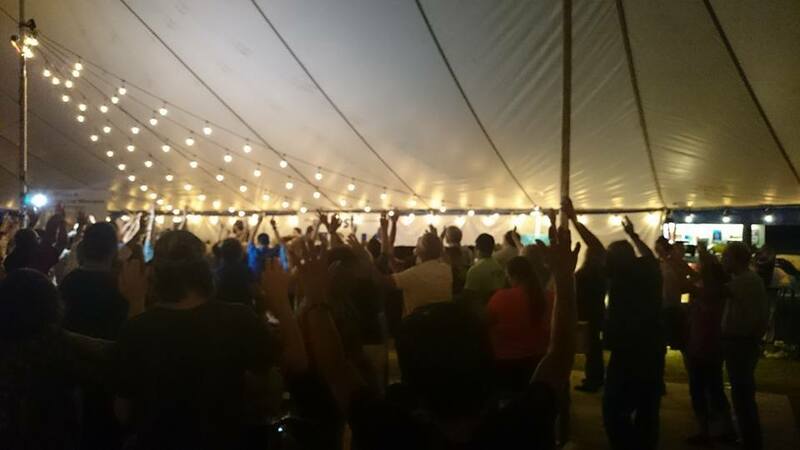 The presence of God was so strong under the tent that it seemed as though heaven bent down and kissed Goldsboro during our time there. God’s love was so prevailing that it seemed impossible not to extend love, forgiveness, or help to someone in need. No judgment or critical attitudes were allowed; nor, was their present any trace of unbelief, fear or disease. Everyone that sought healing received it, all who sought love found it, and on the last night were a crowd of over 500+ gathered, a war cry was released that shook the entire city to its core! Thanks to numerous ministries in Goldsboro, Dunn, Jacksonville, and Wilmington, we were able to feed the poor, team leaders, and worship teams every day and night during the 7 days. A special thanks to White Oak Community Church (Jacksonville, NC) who came and cooked 400lbs. of fish and gave it away Saturday evening for a free fish dinner to all who were present. Over 2,000 people we fed due to this loving display of kindness. Even as they cooked the fish, this church was leading people to the Lord all throughout the property. 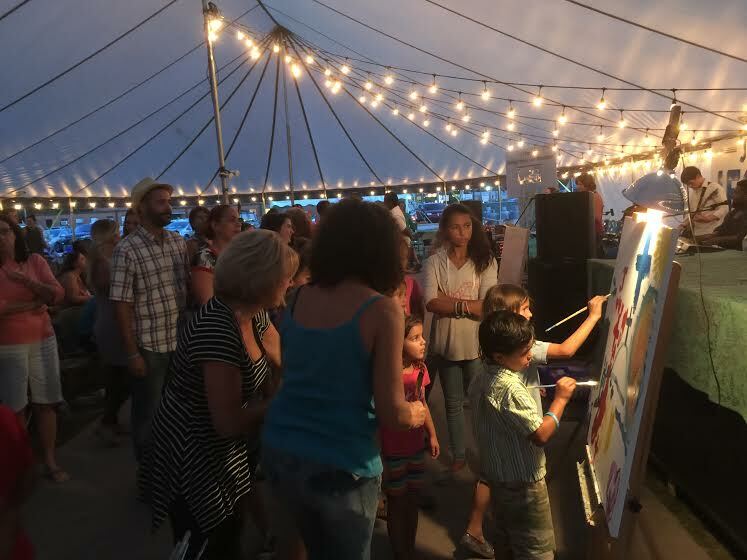 How powerful it was to behold hold a city-wide love feast under the tent where the homeless & wealthy, the ignorant & educated, the saved & lost gathered together and ate dinner as a family. It felt like a page right out the Bible where Jesus provided the crowds with 5 loaves and 2 fish. C-MON!!! In all, we witnessed nearly 50+ people get saved, hundreds of healings that included deaf ears opening, blind eyes restored, and seeing crooked backs being straightened immediately. We also witnessed one of the Wayne County Superintendents of public schools spontaneously call the children of Goldsboro forward, anointing them with oil, and speaking a fathers blessing over them. Many kids who went forward immediately went to the floor under the power of God. I had never seen anything like this before. Under the leading of a highly ranked public school official of that county, many kids were crying and weeping on the floor unable to move. WOW! In addition, some 25 pastors of Goldsboro gathered together and prayed & wept over Goldsboro and each other in one of the most outrageous displays of unity that I have ever witnessed. But Jesus saved the best last, and I want to save the best for last about what God did at Goldsboro. 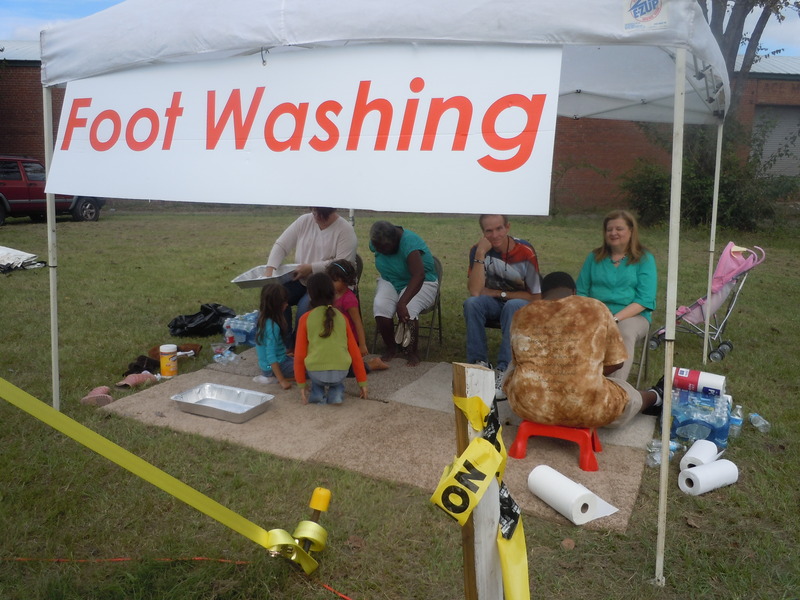 The Lord instructed us to set up a small foot washing tent and “wash the feet of the city.” Little did we know that several small children would help lead the way in washing the feet of Goldsboro’s citizens. 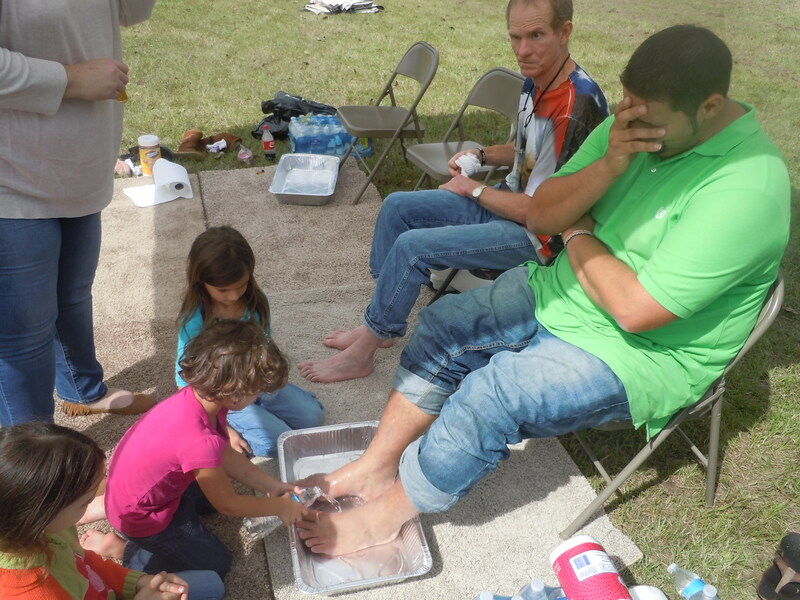 For nearly 3 hours on Saturday, 8 and 5 year olds were bent on their knees and washed the feet of the homeless, the broken, as well as the ministers of Goldsboro; the results? Our foot washing tent became our deliverance tent! What a sight to see some 50 people waiting in line being delivered of demonic forces crying out to Jesus, while waiting for innocent little children to wash their feet and prophesy over them!! No words! Just Jesus!!! We feel that ignite Goldsboro is only the beginning of a prayer & worship movement that is going to ignite every city, campus, and church with power & presence of a Jesus type movement! Keep us in prayer and follow this website to see where we will go next!